This spot was formerly called Kalehuawehe. The surf break ‘Castles’ is named after the Castle family’s four-story beachfront home. In 1837, Samuel Northrup Castle arrived in Honolulu as a missionary. He left Hawaiʻi for a short time then returned as a businessman for the mission. With Amos Cooke, he founded Castle & Cooke Company in 1851 – it grew into being one of Hawaiʻi’s “Big Five” companies. One of his ten children would surpass him as a businessman. James Bicknell Castle was born November 27, 1855 in Honolulu to Samuel and Mary (Tenney) Castle. He attended Punahou School 1867–1873, and then Oberlin College. Castle acquired property in Waikīkī; it had been the home of Boki, the governor of O’ahu, and his wife Liliha. In 1899, James B. Castle built his Waikīkī home and called it ‘Kainalu.’ It was a lavishly furnished four-story mansion with extensive grounds, an ocean pier and other amenities. In business, he greatly expanded Castle & Cooke in the sugar and railroad industries. One of his first moves was in 1890 when Lorrin Thurston and others joined to create the Kahuku Plantation Company on land subleased from Benjamin Dillingham. Castle is credited with winning control of the Hawaiian Commercial & Sugar Company from Claus Spreckels in 1898, which he sold to Alexander & Baldwin for a large share of their stock. He later bought large amounts of land, such as Kāneʻohe Ranch. He then moved to his next phase of his work, which was to connect the Dillingham’s Oahu Railway & Land Co. (OR&L) in Kahuku with the proposed street railway system in Honolulu by way of the Windward Coast. His plan was to extend his Koʻolau Railroad Co. south of Kahana Bay through Kāneʻohe and Kailua, and on to Waimanalo where it would go through a tunnel and into Manoa Valley and connect with the Rapid Transit & Land Co. Unfortunately, he died in 1918 before the project could be completed; however, he ran the line from Kahuku to Kahana Bay and extended his plantation and used this railway to haul it to the Kahuku mill. The train service completely closed down by 1952. When Castle died, his widow found the beachfront property more than she wished to keep up. Mrs. James B. Castle was impressed by the charitable work being done by the Elks (the Honolulu Elks Lodge 616 was established on April 15, 1901) and in 1920 sold them 155,000 square feet on the beach at Waikīkī complete with lavish home, for $1 a square foot. For decades, the Elks membership and officers worked to raise funds to pay off the mortgage. Every possible method of raising funds was tried. Elks held carnivals, “smokers,” baseball matches, boxing matches, theatricals, auctions, circuses, concerts and dances. Funds were raised for charity, and a bit set aside to retire the mortgage. Finally, on March 3, 1943, as members sang “Auld Lang Syne;” the mortgage was burned with great ceremony. Several times since 1920 the sale of the property was proposed and even authorized, but motions were defeated or rescinded. Most prominent was a protracted discussion with the Outrigger Canoe Club, which was looking for a new home. 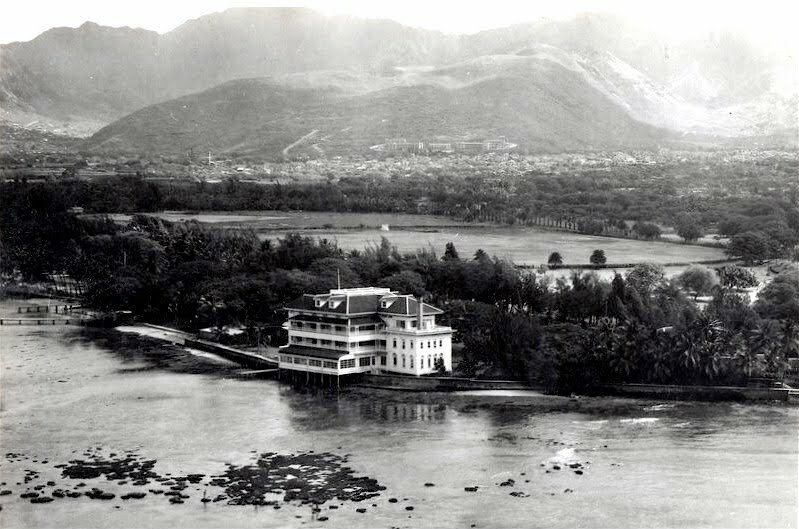 Between 1954 and 1956, Outrigger Canoe Club made several offers to purchase about half the Castle property. All were refused. Eventually, in 1955, the Elks agreed to lease property to Outrigger. Negotiations continued, and a lease was signed effective November 17, 1956. In 1958 the Lodge determined to raze Kainalu and rebuild a new lodge. After an April gala aloha event, the old Lodge was demolished in June of 1959. Ground breaking for the new building took place on August 17, 1959. On June 20, 1960, the first meeting was held in a new building, the present lodge building. In the sand, constantly washed by the waves, are 6 flat-topped black basalt rocks set in cement. The rock is said to come from the Kaimuki Quarry. Also visible is one round, bowl-shaped object. These are the last remnants of the James Castle home. The multi-sided stones were the footings for pillars holding up the Castle home’s dining room. Facing the ocean, 9 tubular wooden pillars sat on the round cement footings, and in the rear a second row of heavier pillars sat on the lava rock. James Castle and his wife had one child, Harold Castle; in the form of various gifts, Harold Castle is the man behind Castle Hospital, Castle High School, Kainalu Elementary, Central Union Windward Church and the Windward Branch of Hawaiʻi Pacific University. The image shows Kainalu, makai of Kapiʻolani Park. In addition, I have included other related images in a folder of like name in the Photos section on my Facebook and Google+ pages. In 1897, the Oʻahu Sugar Company established a large-scale sugar plantation on the dry, southwestern side of Oʻahu. Irrigation water for the sugar-cane plantation was initially pumped from the Pearl Harbor aquifer. Because of the high pumping cost, the Oahu Sugar Company constructed the Waiāhole Ditch System to transport, by gravity, surface water from the northeastern side of the Koʻolau Range. The Waiāhole Ditch collection and delivery system was initially constructed during 1913-1916. The system intercepts large amounts of dike-impounded ground water at high altitudes (above approximately 700 to 800-ft) that previously discharged to Waiāhole (and its tributaries Waianu and Uwao), Waikāne and Kahana Streams through seeps and springs. The main tunnel through the Koʻolau Range was primarily designed as a transmission tunnel. The success of this tunnel in intercepting large amounts of dike-impounded ground water in the Koʻolau Range led to the construction of additional high-level ground-water development tunnels. Between 1925 and 1935, six tunnels with headings directed into the Koʻolau Range were added to the ditch system to develop ground water stored in dike compartments. Four development tunnels (Uwao, Waikāne 1, Waikāne 2 and Kahana) were considered successful. For nearly a century, the Waiāhole Ditch System has diverted an average of approximately 27-million gallons per day of water from the wet, northeastern part of windward Oʻahu, to the dry, central part of the island to meet irrigation needs. This diverted flow consists of ground water gained from the connecting tunnels, the four development tunnels, and the trans-Koʻolau tunnel and of surface water gained primarily from Kahana Valley. The flow diversion through the tunnel is pretty low tech; a redwood board determines the flow direction and amount. Depending on which marker the board is raised or lowered to, more or less water flows to leeward or windward areas. If the board is raised, more water flows to the leeward side. Conversely, the more the board is lowered, the greater the amount of water that flows to Waiāhole stream. The Waiāhole Ditch collection and delivery system is a 26.5-mile-long system, also called “the ditch,” extending from Kahana Valley on the Windward side to the Kunia area on the Leeward side. The effects of Waiāhole Ditch diversions received significant attention in 1993, when it became known that large amounts of diverted water were not being used for irrigation and instead were being released into streams on the leeward side of Oʻahu. This coincided with the Oʻahu Sugar Company announcement of the closure of its sugar-plantation operations. Windward stream water for leeward uses initiated a legal proceeding (Waiāhole Ditch Contested Case) before the Hawaiʻi Commission on Water Resource Management (CWRM) over rights to the water. The Waiāhole case arose from the efforts of small family farmers and Native Hawaiians, led by citizen groups Hakipuʻu ʻOhana, Ka Lahui Hawaiʻi, Kahaluʻu Neighborhood Board, Makawai Stream Restoration Alliance and a coalition of supporters (collectively the “Windward Parties”), to restore streams originally diverted by Central O`ahu sugar plantations. But large scale agricultural and development interests, including Campbell Estate, Robinson Estate, Kamehameha Schools, Dole/Castle & Cooke, and others, joined by the State, pushed to continue the flow of Windward water to leeward lands to subsidize golf course irrigation, short-term corporate agriculture, and housing development. After seven months of administrative hearings, the Water Commission issued its first decision in 1997, which both the Windward and Leeward parties appealed to the Hawaiʻi Supreme Court. The Windward Parties argued that not enough water had been restored to the streams, while Leeward interests complained that too much water had been returned. In August 2000, the Hawaiʻi Supreme Court issued a landmark decision in the first appeal. Although the Court acknowledged the Commission’s efforts at stream restoration, it vacated the Commission’s decision and sent the case back to the Commission. After holding more hearings, the Commission issued a second decision in December 2001, which the Windward Parties again appealed. The Court ruled that much of the decision failed to comply with the State Water Code and public trust principles, and the Commission had failed to make sufficient findings, based on evidence in the record, to support its various rulings. It ordered the Commission to reconsider the amount of water the Windward streams need to support native stream life and community uses, vacated permits the Commission had issued to Leeward interests, and ordered the Commission to make a new decision on the permits that followed from the evidence. 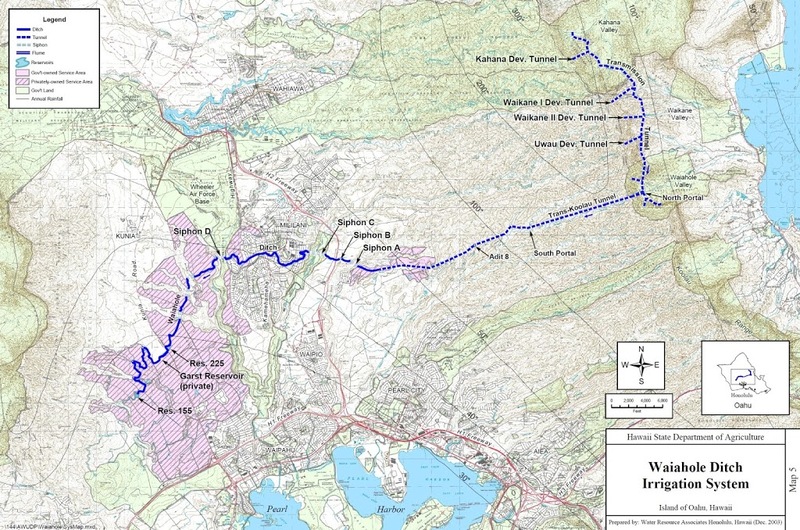 On July 14, 2006, the Hawaiʻi State Commission on Water Resource Management issued a split decision in the landmark water rights litigation over the stream flows diverted by the Waiāhole Ditch System on O`ahu. Four members of the Commission (a majority) voted to largely maintain the allocations the Commission approved in its original 1997 decision, including extensive diversions for Leeward uses, such as corporate agriculture and golf courses. However, two Commissioners issued a dissent criticizing the majority for failing to give more protection to Windward stream resources and uses. As Water Commission Chair, I was happy to have authored the dissent (with significant assistance from the Attorney General’s office) and pleased that Chiyome Fukino, state Department of Health Director, joined me in the dissent. In 2010, the Intermediate Court of appeals vacated the water use permit issued in the 2006 decision and remanded the case back to the Water Commission. (Lots of information here from USGS and EarthJustice reporting on the ditch system and Waiāhole Ditch case.) The image shows the drilling of the tunnels for the Waiāhole Ditch; in addition, other images have been added in a folder of like name in the Photos section on my Facebook and Google+ pages. 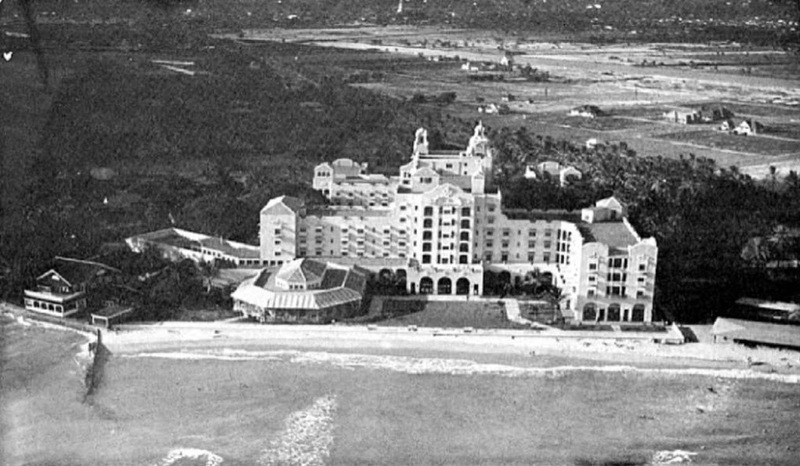 The first Royal Hawaiian Hotel was not in Waikīkī. 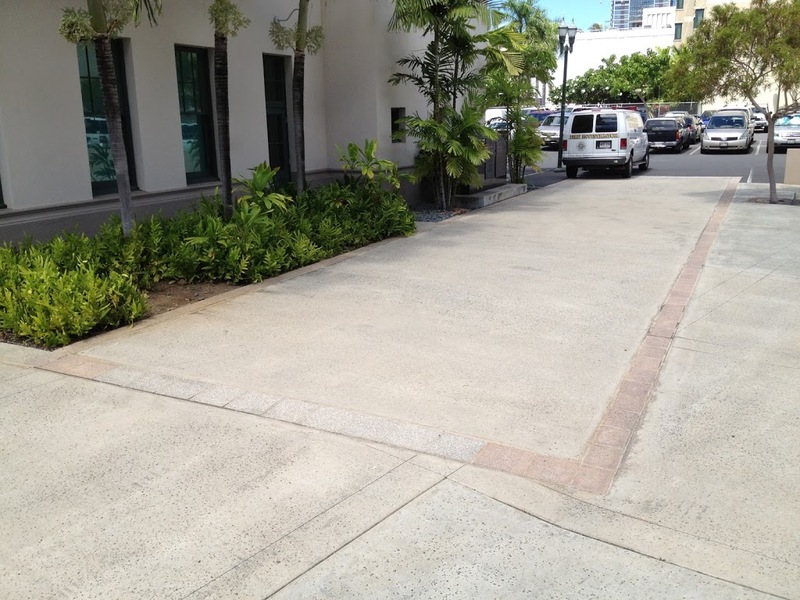 It was in downtown Honolulu where the “One Capitol District” building now stands. By the 1900s, the Royal Hawaiian lost its guests to the newer Alexander Young hotel a few blocks away. The downtown Royal Hawaiian was converted to a YMCA building in 1917. The building was demolished in 1926, and a new YMCA in a similar style was built in its place. For centuries, Helumoa in Waikīkī was the home to Hawaiʻi’s royalty. Portions of this area would eventually become the home to the new Royal Hawaiian Hotel. In the 1890s, the property was leased as a seaside annex to the downtown Royal Hawaiian Hotel located at Richards and Hotel streets. 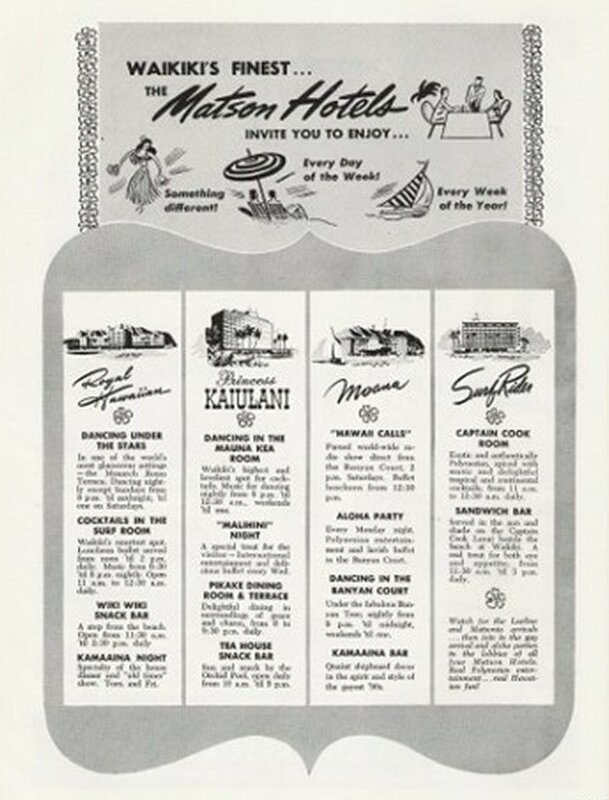 Castle & Cooke, Matson Navigation and the Territorial Hotel Company successfully proposed a plan to build a luxury hotel, The Royal Hawaiian, with 400 rooms on the 15-acre parcel of Waikiki beach to be leased from Bishop Estate. The ground-breaking ceremony took place on July 26, 1925. However, the official building permits were delayed while city officials changed the building code to allow increased building heights. After $4 million and 18 months, the resort was completed. On February 1, 1927, the Royal Hawaiian (nicknamed The Pink Palace) was officially opened with the gala event of the decade. Over 1200 guest were invited for the celebration that started at 6:30 pm and lasted until 2 am. Duke Kahanamoku, the legendary Olympic swimmer and surfer, frequented the Royal Hawaiian Hotel restaurants and private beachfront. The Royal Hawaiian Hotel became a favorite stomping ground for Kahanamoku’s famed group, dubbed the “Waikiki Beach Boys”. Over the following decades, the Royal Hawaiian was THE place to stay and the Pink Palace hosted world celebrities, financiers, heads of state and the elite from around the world. World War II, with its associated martial law and blackout measures, meant significant changes at the Royal Hawaiian. In January of 1942, the U.S. Navy signed a lease with the Royal Hawaiian to use the facilities as a rest and relaxation center for officers and enlisted personnel serving in the Pacific. During the war, over 200,000 men stayed at the Royal Hawaiian. Each day as many as 5,500 service-related visitors (most of who were not staying at the hotel) passed through the front gates to enjoy the beach or social activities. At the conclusion of World War II, the hotel was given a makeover to restore her to the level of luxury her guests would expect. In 2008, the Royal Hawaiian again underwent significant renovation (to the tune of $85-million) and held its official grand reopening on March 7, 2009. The Tower section was renovated yet again in November 2010 and reopened as The Royal Beach Tower with upgraded rooms. Why the color pink? Bob Krauss once reported that the Royal Hawaiian’s pink color is due to the typically pink-painted homes in Lisbon, Portugal. The image shows the Royal Hawaiian; in addition, I have included other old and new images of the hotel in a folder of like name in the Photos section on my Facebook and Google+ pages.